IT IS not only the EPO‘s management that’s pushing hard for UPC; many patent lawyers do the same, regardless of what the European public thinks about it. The public hardly even knows about it because there’s no effort to inform the public. This is why we made it a priority. Well, AmeriKat works for a company that's looking to profit from the UPC. AmeriKat basically spent years promoting software patents and now bats for the Establishment by spending a lot of her time treating the UPC as though it’s inevitable (the same tactics which Clinton proponents use at the moment, misleading those who follow the media). MIP, as of today, speaks to “Alice O’Donkor about her role in creating the Unitary Patent and UPC” (nothing to be proud of, as it’s inherently antidemocratic). Despite many obstacles along the way, this work culminated in a 2013 agreement between most EU member states to set up a Unitary Patent and Unified Patent Court. The agreement ended decades of deadlock since a single EU patent system was first proposed. It is now expected to come into effect early next year. “We had to be extremely creative to overcome all types of legal and political difficulties and to find solutions to seemingly unsurmountable problems. That is something that was hard at times, but also very enjoyable,” said Fröhlinger. She also paid tribute to the “enthusiasm and commitment” to a European project at a time when, in many people’s eyes, the EU does not seem to be moving forward. 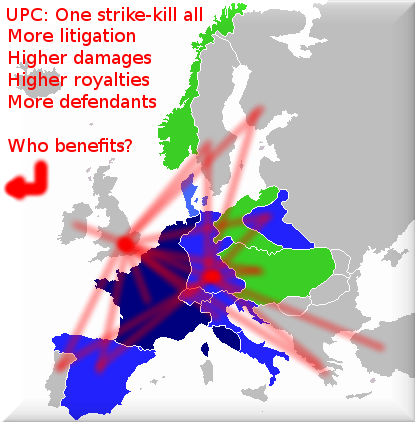 “This whole UPC campaign isn’t obeying law or democracy; it’s stomping on both and makes complete mockery of the very notion of democracy (the public was never asked about it, doesn’t participate in the process and so on).”Asking lawyers in Germany (or Mayer Brown International LLP) about the prospects of UPC is like asking a weapons manufacturer about the prospect of future wars (to which they contribute of course). This whole UPC campaign isn’t obeying law or democracy; it’s stomping on both and makes complete mockery of the very notion of democracy (the public was never asked about it, doesn’t participate in the process and so on). Here in today’s British media we see alarmists stating that Brexit would jeoparadise the UPC (even though UPC and EPO are not a EU thing). To quote: “For the European Patent Office (EPO), the body that grants patents, the potential for a Brexit has come at a particularly inconvenient time after several years of efforts to ratify the new unitary patent scheme in Europe.